These choices are a little bigger than the ultra-portable stoves we’ve reviewed at Camping Things, but they’re still easily packable. Wind can seriously ruin a good time when you’re out camping, trying to cook. That’s why we’ve picked a range of the best camping GAS stoves that are windproof, so that you can keep the heat, no matter how rough it gets. Sturdy on its feet, the EZOWare is all about protecting the flame, to keep food and liquids heating evenly and efficiently. No more on-site frustration, just perfect performance every time. Easy to use flame control valve gives you greater control over the heating of your food, and wind deflector leaves keep the party going while you’re out camping. Weighing in at under 600g, the EZOWare is still pretty lightweight for a more sizable stove. It folds away fairly well for transport in your backpack and storage in your car, and the delicate-looking wind deflector leaves are actually solidly sturdy. Made to withstand the elements and high temperatures, the EZOWare is made from stainless steel and an aluminium alloy. Definitely one of the Best camping GAS stoves available. The main feature of the EZOWare is its series of wind deflector leaves. They fold out and in like flower petals, and are designed to help keep the wind away from the flame. They do so pretty well, and they sit nicely on top of the EZOWare’s solid foundation. Windy days can make lighting the stove outside a problem, and lighting it inside is a recipe for disaster. The EZOWare solves most of that problem. A good contender for the winner of our Best camping GAS stoves review. Well, now we are getting fancy. The Campingaz Chef is a double burner stove and grill, which can house frying pans and food on a grill plate. For when you’ve got a few hungry campers to feed, or for when you’re throwing a tent party, the Chef is an awesome choice. The Chef is self-contained in its own carry case, and runs on gas canisters. The Campingaz Chef isn’t really made for hiking over long distances, it’s pretty heavy, at over 4kg. That said, it stores flat and neatly in the boot of your car, so if you’re off on a weekend camping trip, once it’s out and on-site, the Chef really is no trouble at all. The hose is sold separately, unfortunately, but even with it, the whole lot packs away nicely and neatly. The housing is durable plastic, and the grill and burner set itself is made from high grade steel, for strength and longevity. Ideal for whipping up breakfast on the camping site, there’s enough room on the two burners for frying pans and saucepans, and the downward grill toasts bread pretty quickly. Both burners are adjustable, using the dials on the front, and providing you don’t spill anything, there’s very little cleanup to be done. Compact, safe and sturdy, with enough room to make breakfast for the whole family. Packs away nicely and looks great. The Camp Bistro is a simple, powerful gas burner stove, with space on the side for a gas cartridge. Use the locking mechanism on the front to lock the canister in place and secure the stove. Works well, great build quality and transports easily in the car. There’s no cover on the Camp Bistro, which is a bit of a shame, but as a single burner stove, it’s great. It does come with a hard plastic carry case, which is durable enough to last for years. Really well made, simple construction, it’ll work well on long camping trips. Weighs in at just under 2kg. Enameled pan support offers easy cleaning, the Camp Bistro is pretty light and durable. There’s not a lot of fussy business going on with the Campo Bistro. Campingaz have been making solid camping stoves for years, and the Bistro is a solid investment if what you’re looking for a reliable, single burner stove. As a single burner gas stove, the Camp Bistro is a reliable choice, and the enameled surface is a nice touch, making it easy to clean. The Coleman Bottle Top is a long, upright burner, great for saving space, and capable of holding an 8 inch frying pan on top. Features Perfectflow and Perfectheat technology to ensure even and efficient heating. The burner and base of the Bottle Top separate from the propane bottle for easy compacting and storage, and wind protectors help to keep the heat centred and flowing. The Coleman packs away into any large rucksack, and separates from the canister if you want to share the load. The stove itself weighs just a few hundred grams, making it efficient and powerful. 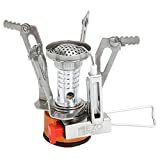 Made from high quality steel and aluminium, Coleman know their stuff, and this burner is a great choice for hiking trips and weekends away camping. Made to perform in extreme conditions, the Coleman features Perfectflow and Perfectheat technology, which keep the heat flowing straight up, so that no energy is wasted. The appropriate gas canister will last up to nine hours on low in the Coleman, and with enough room on top for an 8 inch pan, it’s about as a close as it comes to cooking on an indoor burner. The big burner platform and high, efficient heat mean that food is heated quickly and efficiently. That’s all you really want from a burner, right? The Coleman has it, and it works every time. The ‘Leave no trace’ principle states that you should do all you can while out camping and on the trail, to reduce your footprint. The Etekcity is tiny, powerful, and won’t damage the surrounding ground. It’s compact and collapsible, and is compatible with a wide range of fuel canisters. Features four steel and aluminium alloy stents — simply screw the Etekcity into your fuel canister and away you go. The most portable backpacking stove we’ve ever seen. Never mind the backpack, you can fit the Etekcity in any decent sized pocket, and it comes in a handy, brightly coloured carry case. At under 400g, it’s compact, but solid, and even though it’s small, it packs a punch. The Etekcity is made from high quality, durable steel and aluminium alloy. Guaranteed to last a long time, the Etekcity features a cellular furnace for even and efficient burning. One of the simplest and best camping GAS stoves available. The Etekcity adheres to the ‘Leave no trace’ principles of conscientious camping. Burns clean and lean, leaving no trace, debris or soot. For its size, the Etekcity is packed with great features, including a flame control handle and a built-in ignition switch. Its screw-in base is compatible with plenty of fuel canisters, and for something so powerful to fold away so compactly, we think the Etekcity is hard to beat. Super small, ultra portable and legitimately powerful enough to heat food quickly and efficiently. Easily a contender for the winner of our Best camping GAS stoves review. No more on-site frustration, just perfect performance every time. Made to withstand the elements and high temperatures, the EZOWare is made from stainless steel and an aluminium alloy.